An Intervin Top Ten Winery! Very rustic… very scenic… very good wine! This vineyard, located in the Vinemount Ridge Appellation is the site of the winery operation and 20 acres of premium vinifera grapes. What is often mistaken for a silo on the side of their renovated barn, is in fact the Chronos Observatory. Inside the observatory in a deep space telescope capable of viewing interstellar bodies in significant detail. 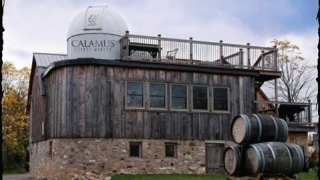 Calamus Wines are now available in 45 cities, and 135 establishments.